your such a quick sewer! there is one in Middlesbrough and then another shop around a 2 min walk from the Middlebrough boyes called stitches whcih stock nice fabric but the staff arent the friendliest! How adorable ^_^. I've always wanted to sew one of these but couldn't find any easy tutorials that resulted in a good looking skirt. I just had two questions. When you cut out your pieces, do they create a full circle or a half circle? In other words is your original waist measurement of your cloth 3 times are large as the original measurement or is it 1.5 times as large once you've cut out your pieces. My 2nd question is do you have any advice/tricks for cutting out the pieces so you waste as little fabric as possible? Thanks. 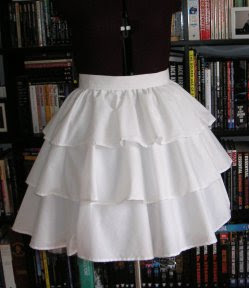 Hi, the tutorial on the weekend designer site makes a half circle skirt. Mine is a 3/4 circle skirt as I added an extra section - so it was 1.5x my waist. I cut the first two sections from folded fabric then unfolded it for the last section. I tried to put the biggest tier into a corner but I think the curves mean that its difficult to avoid wastage. I'm using the left over bits from this one to make Halloween decorations. Thank you for answering my questions. You've really simplified it for me and I can't wait to start working on it ^_^. Hi I just wanted to know when you made the skirt does it flare out naturally? Or did you have to use a petticoat? Hello! I was just wondering if you adjusted the length of your tiers to get a loli-length skirt? If so, about how much?